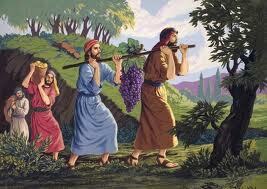 Parashat Shelach (Send) – the sending out of the 12 spies to spy out the land and plan for its capture and settlement. The resultant report upon their return led the people of Israel into a 40 year diversion, one year for every day of faithlessness. However, God’s plans are never thwarted or diverted; in this case, Israel was settled but by a different generation. The passage begins with ‘sh’lach l’cha’, or ‘send thou’, or ‘send for yourselves’. Another translation has been offered of this: ‘Send then, if you please, or want. Go ahead, if you don’t believe me, have a look for yourselves’. Both reveal the two aspects of a faith response: trusting God because He is God, and yet also knowing for yourself that God is trustworthy by having the evidence in your own life that despite what circumstances may be saying, God will keep His word. This is vital because a theoretically based faith, or a faith borrowed from others, is not going to survive the knocks of life. The people lacked the internal conviction that a visual ‘check’ would bring. And of course, this brought problems. We may argue that ‘pure’ faith doesn’t need evidence but whilst that may be true, it could be argued that this is really ‘blind’ faith. But the moment we bring our need to ‘verify’ faith into the equation we start to stack up the problems. However, deep, reasoned and experiential faith IS precisely drawn upon ‘being there’ at such crisis moments and seeing God come through despite the circumstances. Such faith is not blind, yet arriving at such a place of deep inner conviction is not always easy. It takes time and resolve to build up this type of faith, to walk with God come what may. It’s not for the fainthearted but demands commitment and dedication. In fact it took 40 years and a whole new generation to build up that level of faith through seeing God’s provision in the desert, before Israel was ready to move into the Land. And Yehoshua and Calev, the two who had demonstrated that faith, taught it during those 40 years to the next generation. So surely then all we need is to see God act in our lives in a powerful way! Yes and no. Miraculous signs in themselves are no guarantee of anything and if we build our lives on the spiritual need for them, we surely will be destined to live an immature spiritual life. Each day becomes an issue of ‘will he, won’t he?’ rather than simply a certainty of who God is. An emotional response to a supernatural event is good if it leads to a deepening of the relationship with God but if it becomes an emotional need then your faith will not grow and develop so when the real tests come, you will crumble. In the end, it’s not about depending on the externals but drawing from them and knowing God in a deep way for who He is. Job, throughout his debate with his so-called friends, learned to frame the certainties of God in a new way, realising gradually that he had to rise above the circumstances to a real faith, based in a confidence of who God is eternally and in His ability to fulfil His plans and deliver and save as His sovereignty requires. And in the end, Job also saw that happen. The paradox is that even if we are in unbelief and walking with a lack of faith, God will still act! The difference though is that we won’t see it or recognise it. How often have we not walked so closely with the Lord and upon restoration have looked back and seen how through it all, God was at work, just unseen. In Psalm 95:7-11 the psalmist likens a lack of faith to having a hard heart, a spiritual blindness that doesn’t see the signs of God at work because these things are only seen through faith. At its heart is the consideration of the personal choice to have faith; not to allow circumstances to dictate your faith life but to build on the confidence in, and certainty of, God. The Haftorah portion provides us with a good example of this trust and faith in the God of Israel by someone not born Jewish. Read Joshua 2:8-11: Rahab showed more faith in God’s power than the 10 spies who brought a negative report 40 years previously! She courageously trusted in the mercy of God, and He spared her and her family. In what must have seemed almost a suicidal decision to trust foreigners rather than her own gods for deliverance, she stepped out and held to the God of Israel in faith. She had heard enough about the One true God to know that whatever happened, she needed to be with Him. Rahab was not alone either. Avraham avinu demonstrated the same faith, walking the Land that was destined to be his inheritance yet never seeing it himself, because his faith was based on the certainty of God. As one commentator puts it, he acted like a founding father long before he was one. The prophet Jeremiah bought land while the siege mounds were being constructed against Jerusalem because he knew the certainty of God. To act in the reality of future promises given by the God whose Yes is absolute, is faith not madness. Consider Herzl, a man and visionary of more recent times who said in his diary (3 September 1897) a few days after the First Zionist Congress in Basel, Switzerland: ‘Were I to sum up the Basel Congress in a word — which I shall guard against pronouncing publicly — it would be this: At Basel, I founded the Jewish State. If I said this out loud today, I would be answered by universal laughter. Perhaps in five years, certainly in fifty, everyone will know it’. Is this where you are right now, or are you still buffeted by circumstances, good or bad? You need to stand on the only solid ground there is: the certainty of God.